Cecilia "Pudge" Kleinkauf a retired University professor and lawyer, a long time flyfisher, has owned and operated Women's Flyfishing® for 30 years. She offers lodge-based flyfishing schools and small group guided trips throughout Alaska for salmon, trout, grayling, char, and pike. She also leads saltwater fly fishing trips to Mexico each year and offers a fly fishing school in conjunction with the John Campbell Folk School in North Carolina. Pudge took the winning sailfish in the 2005 Sails and Tales Fly Fishing Tournament in Zihuatanejo, Mexico, and is scheduled to lead a fly fishing school for women in Swedish Lapland in July, 2006. She serves on the pro-staff of Mustad Hooks, Ross Reels, and Patagonia. Pudge is a regular presenter and fly tyer at outdoor shows in Alaska, California, and Washington. She's been featured in the Anchorage Daily News and is one of the Special Explorers for the Alaska Magazine Television Series on PBS and she's a Board member of the International Women Fly Fishers. Pudge is the author of Fly Fishing Women Explore Alaska, Epicenter Press, 2003, River Girls: Fly Fishing for Young Women, Johnson Press, 2006, Fly Fishing for Alaska's Arctic Grayling, Frank Amato Publications, 2009, Pacific Salmon Flies, Frank Amato Publications, 2012 and Rookie No More: The Fly Fishing Novice Gets Guidance from a Pro. She also serves as a contributing editor for Fish Alaska Magazine. She serves as an Elite Pro for Sage and a pro for Patagonia. 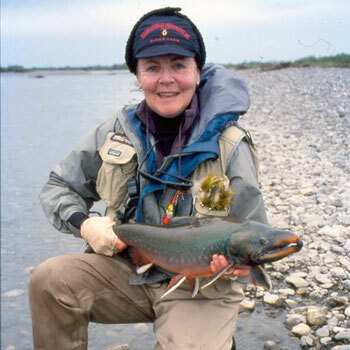 For more information on Pudge's trips, school and guide service visit her website at www.womensflyfishing.net.